Four teams from California took home CAHA Tier II state championship banners in early March, with two going to the Golden State Elite Eagles and one each to the OC Hockey Club and Anaheim Jr. Ducks. The Eagles won the 18U AA division, winning all three tournament games. On March 11, they skated to a 6-0 victory over the Jr. Ducks. They followed with a 2-1 win over the California Wave on March 12, and in a rematch with the Jr. Ducks in the March 13 championship, rolled to a 4-1 triumph and a trip to the USA Hockey Youth Nationals. The Jr. Ducks also qualified. The Eagles’ roster includes forwards Vinny Abdallah, Donovan Garcia, Davis Holmes, Kellen Ireland, Benjamin Kottmeier, Ryan McAuliffe, Matthew Newberger, Tristan Waechter; defensemen Devin Wallace, Kyle Corliss, Nino O’Connor, Adam Keeler, Matt Dutcher and Derek Ellingson; and goalies Carson Murison and Max Kelly. 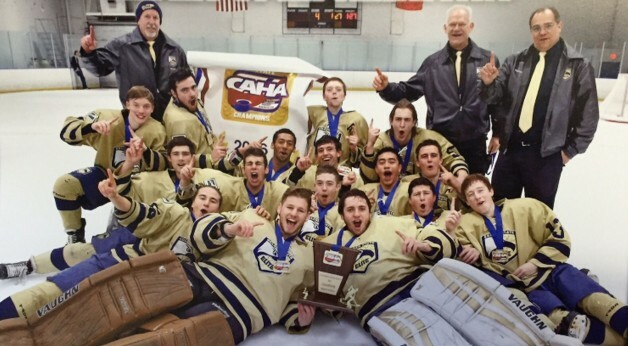 In the 16U AA division, the OC Hockey Club turned in an impressive performance to take home the state title. After toppling the Blackhawks 5-1 on March 11, they fell to the Jr. Ducks 2-1 on March 12. They beat the Blackhawks again later that day 5-3 and then beat the Jr. Ducks twice in overtime on the same day to capture the championship. They secured a 3-2 win in five overtimes on the morning of March 13, and came back in the afternoon to top the Jr. Ducks 2-1 in OT. OC Hockey Club’s roster includes forwards Justin Camba, Kevin Peck, Jake Thomas, Nico Santoro, Tyler Smith, Alec Grace, Hunter Norris, Liam Okanski, Brian Clem, Isaac Schuster, Joey Lambur and Jacob Padgett; defensemen John Pratt, Evan Cronkhite, Spencer Haskel, Brandon Washiashi, Jake Brubaker and Zach Carnes; and goalies Jared Labadie and Angus Hill. “We had some really good energy from the younger guys on the team and some excellent leadership from the older players who had been to nationals before,” said OC Hockey Club coach Jean Labbe. The Jr. Ducks overcame an early defeat to win the Bantam AA state title. They beat the Wildcats 3-2 on March 11, but fell 3-2 to the Wave the next day. They responded with a 4-0 win over the Wildcats later on March 12, and beat the Wave twice on March 13 (3-2 and 7-1) to bring home the championship banner and qualify for nationals. The Jr. Ducks’ roster includes forwards Kyle Baker, Michael Baseggio, Brendan Carley, Bryson Fletcher, Zachary Lane, Timothy Marchant, Connor McMahan, Kyle Melchior, John Mulvihill, Aidan Petrie, Shane Swanson and Alex Villa; defensemen Nolan Conrad, Wyatt Allan, Morgan Frey, Parker James, Tyler Kurth and Aiden McDonald; and goalies Garrett Kennedy and Nathan Lane. The GSE Eagles also won the Pee Wee AA division, sweeping their three games. They skated to a 4-3 victory over the Jr. Ducks on March 11, and on March 12 secured a 6-2 victory over the other Pee Wee AA team from their own program. In the March 13 title game, they upended the Wave 5-2. The Eagles’ roster includes forwards Hunter Hayes, Dias Belda, Romeo Brusola, Stanislav Pupkov, Benjamin Flett, Connor O’Keefe, Neil Johnson and Tristan Delia; defensemen Kyle Mackintosh, Ryan Coultrip, Kenan Isik, Alexander Cagan, Kai Zeng, Ryan Nutt and Karley Garcia; and goalies Owen Millward and Bradley Janssen.